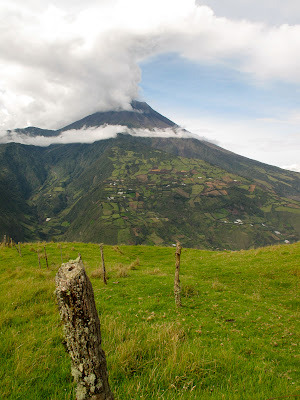 Day 5: Our entire stay in Banos was marked by Volcán Tungurahua, which went off every half hour or so. Not only could you hear each eruption, some of them shook our hostel. On the clearest day, we took a taxi up to the power lines opposite the volcano for a better look. A video of one of the blasts follows the pictures and volume would help. Later in the day, we boarded a bus for Puyo, a jungle town deemed the "gateway to the Amazon." We found a monkey rescue center and spent several incredulous hours with the monkeys, who climbed and played all over us. Volcanos and monkeys?! How do you guys find this stuff? Very cool. Are the monkeys notorious thieves there like the ones at the BOlivian rescue center? I had one try to hang by his tail around my neck - not comfortable. Your series of Ecuador pictures is incredible. Each day just kept getting better than the day before. So fun! Just back from a 9-day get away, so just catching up on your trip and the photos. Incredible pictures! Some of them look professional! Can't wait to hear more about it. Plan on skyping this week.